The Melbourne Rebels (also referred to as the RaboDirect Melbourne Rebels) are a professional rugby union team based in Melbourne, Victoria, Australia. They will debut in SANZAR's Super Rugby tournament in 2011. They are the first privately owned professional rugby union team in Australia. The club shares its name with a former Australian Rugby Championship team, but the clubs are distinct. 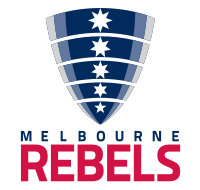 The Rebels name was chosen for the Melbourne ARC team in consultation with the local rugby community; VRU officials decided on the Rebels name in reference to Victoria's first Wallaby, Sir Edward "Weary" Dunlop. Chris "Buddha" Handy at the launch, said that "like the great Weary Dunlop, Victorian rugby has a history of daring to be different, a touch of the larrikin, and always having a go. These qualities are what you want in a Rebel and characterise the way Victoria is successfully tackling this historic year." The name was retained for the Super team.